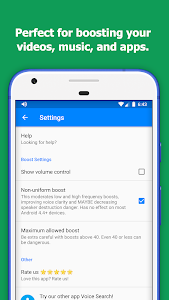 Simple, small, free app to boost your speaker sound volume. Useful as a volume booster for louder movies, louder games, and as a music booster. Also works great as a volume booster for headphones. 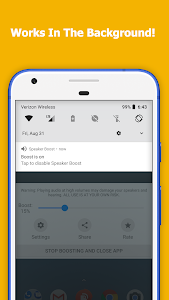 With speaker booster you can increase speaker loudness and the music volume of your mobile phone. It is a music amplifier and music booster that makes your phone louder. USE AT YOUR OWN RISK. Playing loud sound at high volumes, especially for a prolonged amount of time, can destroy speakers and/or damage hearing. Some users HAVE reported destroyed speakers and earphones. IF YOU HEAR DISTORTED AUDIO, LOWER THE VOLUME (but it may be too late). 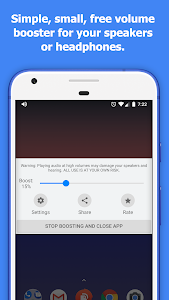 This is the most reliable volume booster and music booster for android but not all devices support this software. Try the music amplifier AT YOUR OWN RISK and see if yours works. 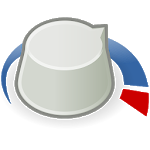 More reliability tweaks for the volume booster. The ultimate volume booster is now in 19 languages! Similar to "Speaker Boost - Volume Booster"